This is worth waiting a year and a half for, though. BNW is great because when someone new drops by to say "I love this about this mod" and "I hate this about this mod", the things loved and hated are different for each person. That was actually longer than one minute, haha. Glad you're enjoying BNW! Anybody know what happend to those FFT SSCC archer videos? Based on google searches, I think one of them used to be here: https://www.youtube.com/watch?v=pgC3J_hHZwY Perhaps you can star there and use one of those services that finds deleted videos? Weighing in on "musn't". Google says: Mark Twain, Huckleberry Finn: "So I said it wouldn’t be no use to try to play it any longer, and I would just make a clean breast and tell her everything, but she musn't go back on her promise." So it's a weird form, perhaps allowable. But if we're going for consistent Shakespeare, he used "mustn't", with two 't's. Agree with recommended change. I still don't get how we're up to Civ VI and still don't have the production quality of those Civ II videos. So enjoyable! Also, I miss building my throne room. There's a part of me I hate that will, instead of playing this undoubtedly excellent mod, throw Firaxis more money for their new crappy Civ VI DLC because graphics/music. 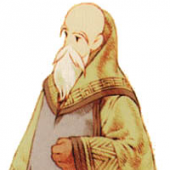 If I can reply to the presenting question: FFT 1.3 is one of the greatest video game mods of all time, despite its many flaws, and deserves a 1.4 the same way Philsov's 1.2 deserved Archael's 1.3. The "low hanging fruit" for 1.4.0.1 would be to simply remove some of the CH 4 immortal flags and make those battles more interesting than "Haha! Power Source!" Seriously, don't change any classes or abilities or speed-is-the-only-stat or anything big-picture like that, just find some ways to make those last-chapter battles a bit more differentiated one from another. Even easier, there are a few quality of life improvements that would go a long way to making the game more enjoyable. Your first time through the game, it's easy to be unaware that some units are "immortal," and that can be confusing. Give them unique sprites. Honestly, just changing all the immortal-flagged or unique-classed or non-player-accessible-ability-having enemies to look different from the classes you can access as a player would be a great improvement. Start with Germinas Peak. Oh man I moved last month and my life has been crazy and I missed secret santa. Which is probably for the best since I totally would not have the time to make anything. But I will lurk in the dispersal thread after the fact to see what cool things emerge in the first NG Plus Secret Santa! Ooh, can we lampshade Cyan by having him speak even more outrageously overwrought Early Modern English? Just for kicks, I did a speedrun of (vanilla) Final Fantasy Tactics. I tried to stream it, but my Internet connection was too spotty and I lost the stream about an hour in. Anywho, if watching me play FFT while talking to myself for six hours sounds like a good time, enjoy! What started me on this adventure was that I saw that the speedrun.com leaderboard had a tenth place time of 9h11m41s, which I was sure I could beat with minimal effort. I got a good feeling! That's the way! I'm not a bugfixer but I'm giving you a +1 for a first-post bug report with detailed and useful information! Welcome!